Rimer Boxe stage a big show October 15 in Madrid. On top - as previously reported - superlightweight Ruben Nieto (18-1) take on Venezuelan Ernesto Espana 19-0) for the vacant IBF Intercontinental title, Nieto (pictured) just relinquished the EBU title to go for bigger things and this is a first step. In the chief supports featherweights Sergio Prado (13-6-0-1) and Marc Vidal (7-1-4) clash for the vacant EU featherweight title in an all Spanish matchup and Melania Sorroche and Maria Lozano go at it for the vacant IBF I/C female bantamweight title. Paulie Malignaggi will not go for the EBU welterweight title. He was official challenger until last week but pulled out and the vacant title will now be contested by Ahmed El Mousaoui and Ceferino Rodriguez a/k/a Ferino V. The EBU have October 5 as deadline for purse bids or agreements. Former WBA superlightweight and welterweight champion Souleyman M'Baye (41-5-1) continues his comeback October 22 in Deauville with a fight against experienced Pole Krzystof Szot (19-18-2) in a fight scheduled for eight rounds. The 41-year old M´Baye returned in March after two years out with a hardfought split decision over Alexandre Lepelley (19-7-1). 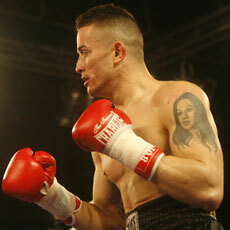 In the co-feature rising superwelter Maxime Beaussire (22-0) is in against Pole Artiom Karpets (21-3).